Remember the Poconos of your childhood? Pristine and undeveloped yet plenty to do? That's what we offer in our beautiful, nature filled gated community. Miles of woods to explore yet only 4 miles from brand new 'The Fun Station' which has an arcade, driving range, bowling and mini-golf. 30 minute drive to Camelback/Camelbeach, Claws 'N Paws and Mount Airy Casino Lodge. provided, please bring your own bath and pool towels. beautiful gas fireplace and brand new 37 inch flat screen TV, dining room, sun room with additional seating for 5 as well as a table that offers additional dining capacity for 4, fully equipped kitchen, washer and dryer. tennis,bocce courts and a playground. Pets: Well trained, housebroken dogs over the age of 1 year are considered, but must be discussed and approved prior to the signing of the contract. Dogs must be bathed and treated for fleas and ticks prior to your arrival. We request that you kindly bring your own bath and pool towels. Please note: Pool is available from Memorial Day to Labor Day, however weekends only until Mid-June. Barbecue grill is not available during Winter months. Each room has it's own ductless system. Apple TV provided in living room. Contains live streaming for Hulu, Netflix, Amazon Prime. First floor bedroom has the same. The kids can go into that bedroom and watch shows that they prefer. Seating for 6 at table and 3 more at breakfast bar. Canoe is kept at the lake. Key to lock is hanging on the key holder by the front door. The canoe is stored on a boat rack. It is the rack closest to the clubhouse. Rack #3 Space #13. Paddles and vests located on front deck. Beatiful pool area that overlooks the lake. Never crowded. Pool heated but not overly warm. Pool and lake are 1 mile from the home within our private community. Three story, so lots of private spaces for family. Warm and comfortable. Bed warmers were a sweet, welcome touch! We had a very enjoyable week here over Thanksgiving and would definitely consider returning. Home is cozy and comfortable and suitable for a small family vacation. Owner was very accommodating. Provided very clear instructions and if followed your access to the place and coming and going is very easy. 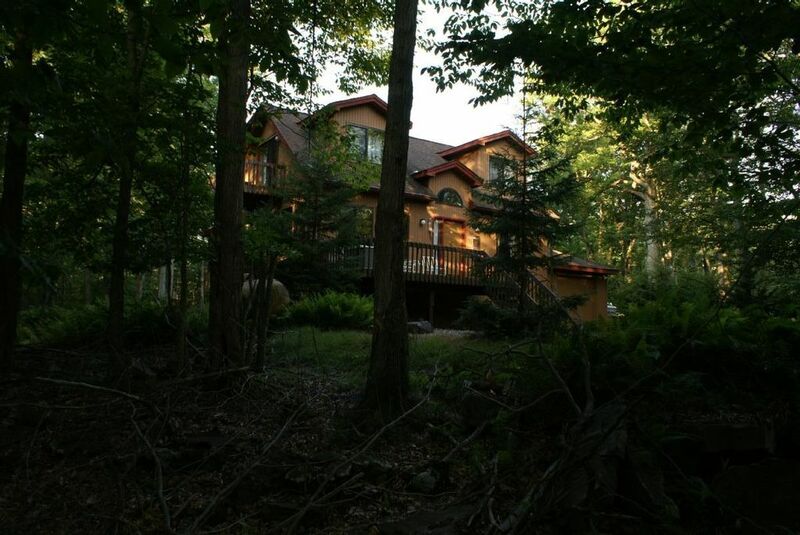 We had a wonderful, relaxing time at this Pocono home. Our family saw many deer and turkey too. And one day at the pool, a bald eagle flew over us. The canoe was great for my husband and son to go fishing. This home was beautiful with four comfortable beds, and air conditioning units in each room with adjustable thermostats. Moose, our granddog, felt right at home too. He loved all the space inside and outside the home. The kitchen is stocked with a ton of spices and there were many condiments in the fridge. The dishwasher works perfectly, and the internet was a strong connection for all of us. Lastly, Donna is an amazing host. She quickly responds to questions via text, email, and phone. Cozy, clean well equipped house. Enjoyed our stay despite all the rain. Had daily visits from quite a few curious deer. Beautiful lake and pool area. I have to say that the house was set up beautifully and was immaculate. Loved the fact that there was a bedroom on the main floor , 2 bedrooms upstairs and 1 bedroom on the lower level as it suited our family perfectly. There were constantly deer coming around and they were enjoyable to watch through all of the large and bright windows around the house on the main level. The pool was located in close proximity to the house which was convenient. Each room had its own television and a/c unit which was a plus!! Household items were well stocked and they even provided the bed linens for all of the beds. The house is surrounded by woods which was nice to walk through and explore. Donna and Hans were very responsive to any concerns that we had during our stay. We thoroughly enjoyed our visit !! The hosts were super welcoming and the house was great! It was just like being at home. The area is very quiet, the community is clean and cozy! Loved every minute. Thank you and please know that you are welcome back at any time. Halfway between Mount Pocono and Lake Wallenpaupack and just a stone's throw from Tobyhanna and Gouldsboro State Parks. We are in a gated community devoted to the preservation of nature which offers a pool, clubhouse, basketball, tennis, bocce, handball and 2 playgrounds as well as a beautiful lake on which you can boat and fish. Nearby are both fine and casual dining as well as Mount Airy Casino Resort, The Fun Station, Camelback/Camelbeach, The Crossings, unique pottery studios, gift stores and more. Ski: Just a 30 minute drive from Camelback. Plentiful cross-country skiing available on the trails just behind our home.